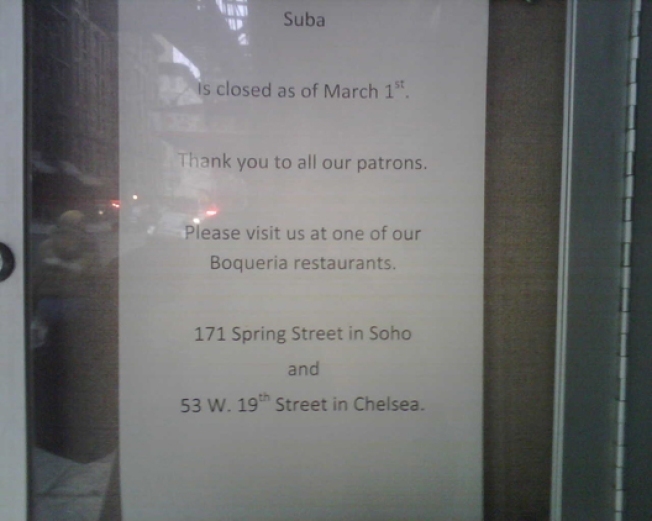 Suba has gone to meet the great tapas maker in the sky. Good morning and welcome to March, the third month of this year. Thank god it wasn't a leap year because I'm not sure if the restaurant industry could have handled one more day of February slaughter. A is for Ambrosia, once sweet but since soured. B is for Bull Run once for brokers, now broke and deflowered. C is for Cafe De Nova, old and now ova. F is for FR.OG, poorly punctuated conceit. N is for no faith, if Miracle Grill was catholic, it would now be lapsed. R is for RIP: Le Gamin, Cookout Grill et al who've all gone out feet first, led by the economy's sneaker. Z is for Zero to which One Ten Grill now add up to in sum.